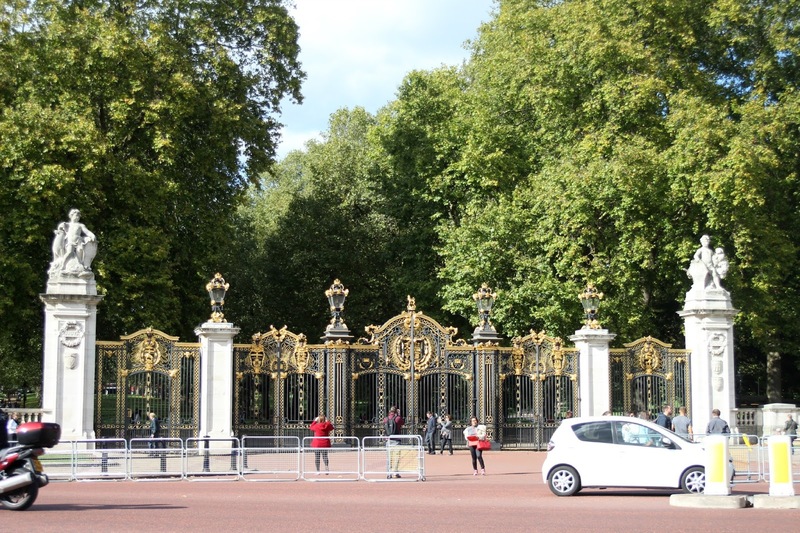 Don’t miss Buckingham Palace & The Royal Mews if you are planning a trip to London. 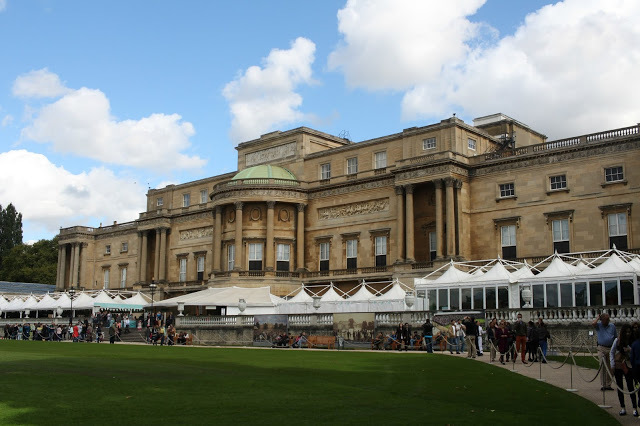 Check the dates for when the palace is open to visitors. 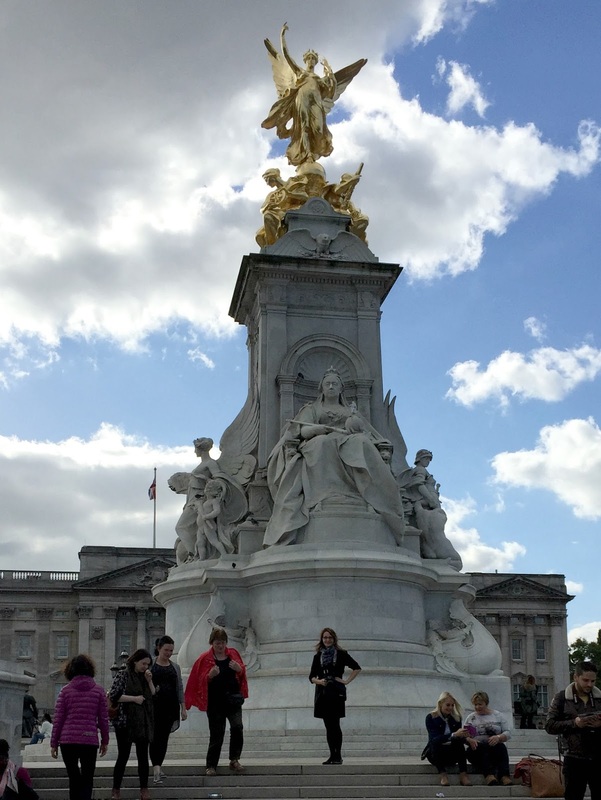 As one might imagine, Buckingham Palace is most beautiful and quite interesting to tour. The reason we planned our trip to London when we did was so we could visit Buckingham Palace, the official London residence of the Queen, and to view the State Rooms as well as the Royal Mews. 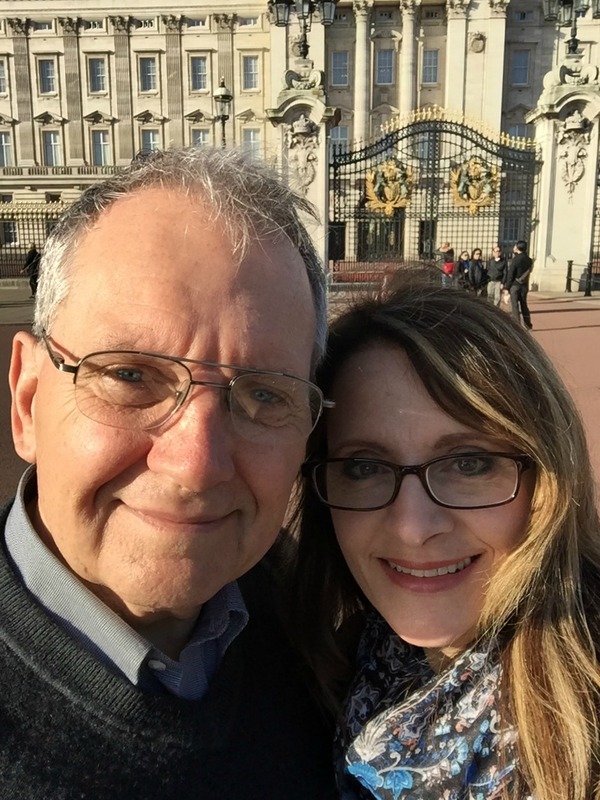 Visiting is only when Her Majesty is away for the summer months. Buckingham Palace is one of the world’s few remaining working royal palaces. We began our second day with a breakfast at the hotel. 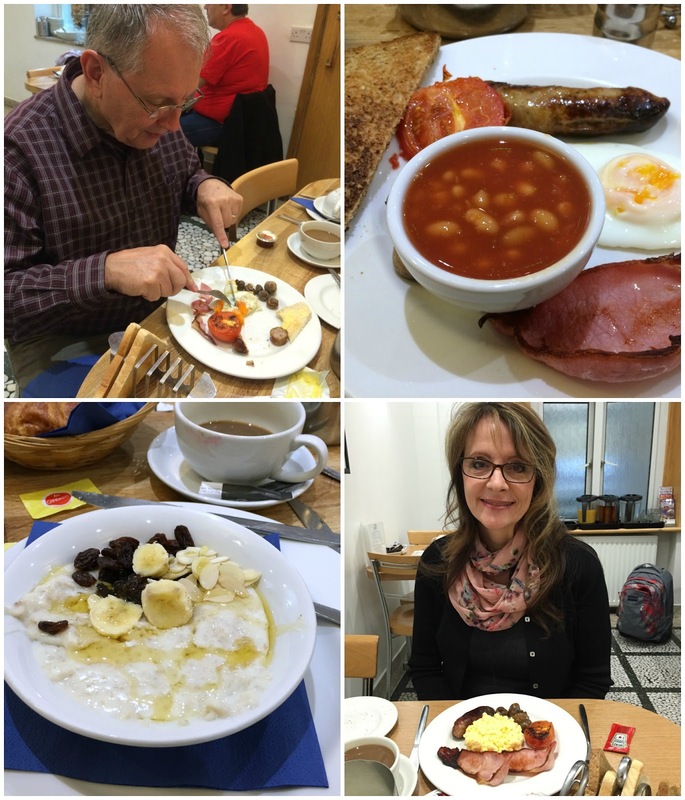 A traditional full English breakfast includes bacon (traditionally back bacon), fried, poached or scrambled eggs, fried or grilled tomatoes, fried mushrooms, toast with butter, sausages, and baked beans. During our time there, I also enjoyed the porridge (oatmeal) topped with raisins, almonds and sweetened with honey. Off again to the King’s Cross station bound for Buckingham Palace. 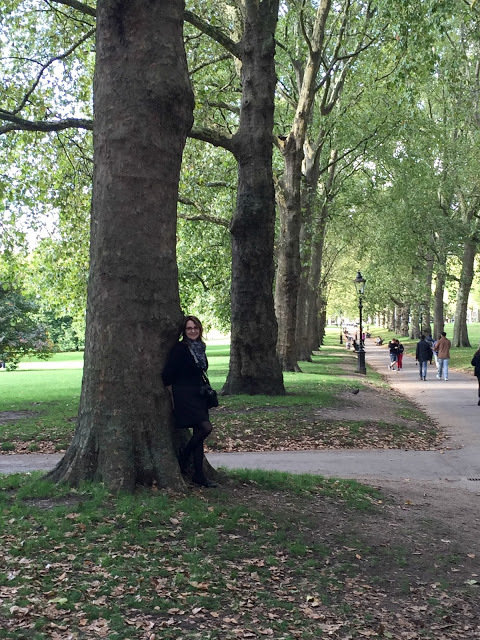 From the Underground we walked through beautiful Green Park. 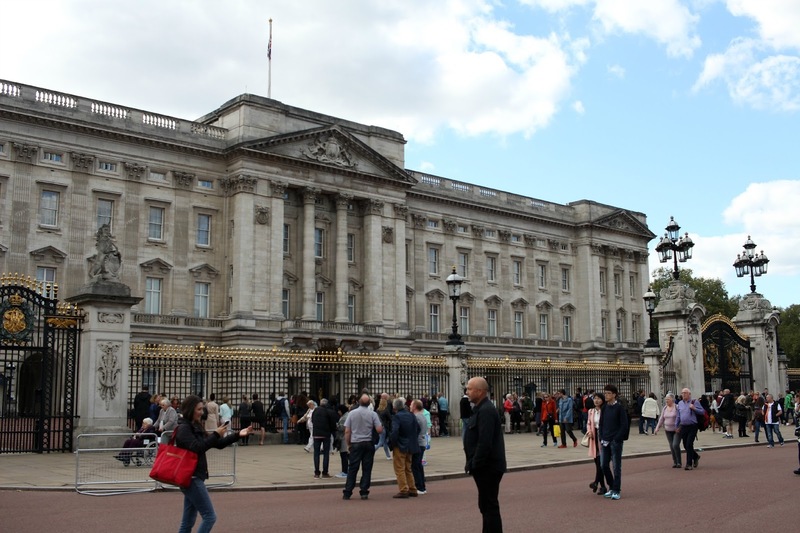 Crossing the street from Green Park we approached Buckingham Palace. 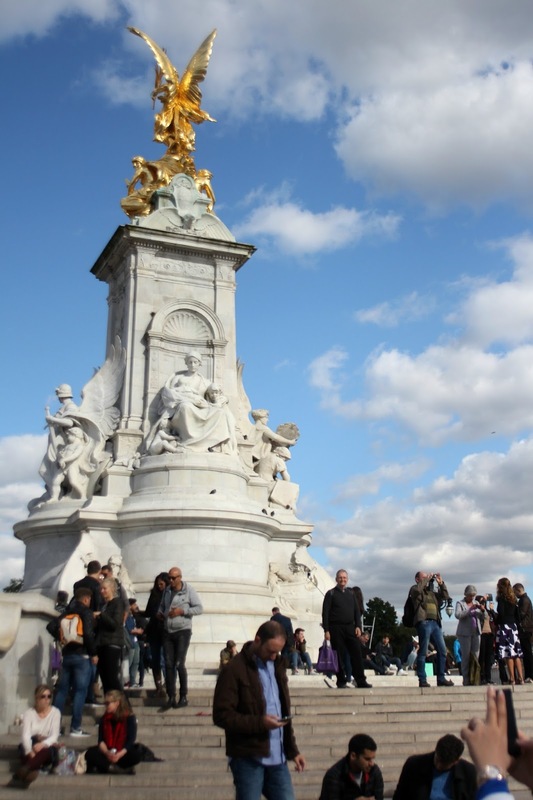 John in the crowd at the Queen Victoria Monument that stands in front of Buckingham Palace. 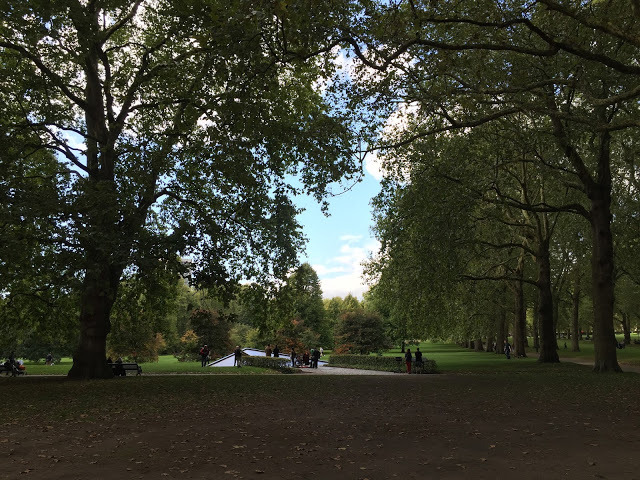 a day of beautiful weather. We exited the Palace at the back and headed to a lovely patio cafe. 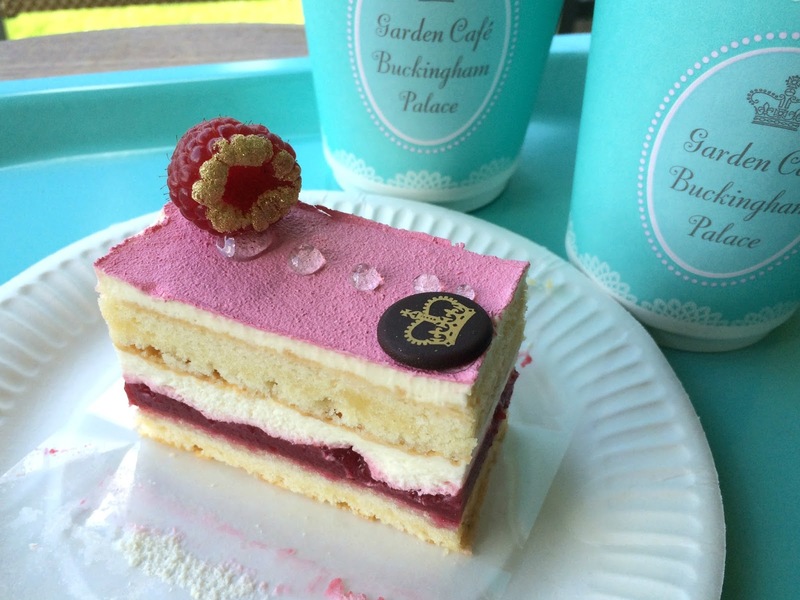 Sponge cake with raspberry and cream. Gates from Buckingham Palace to The Green Park. John at the stately Palace Gate. 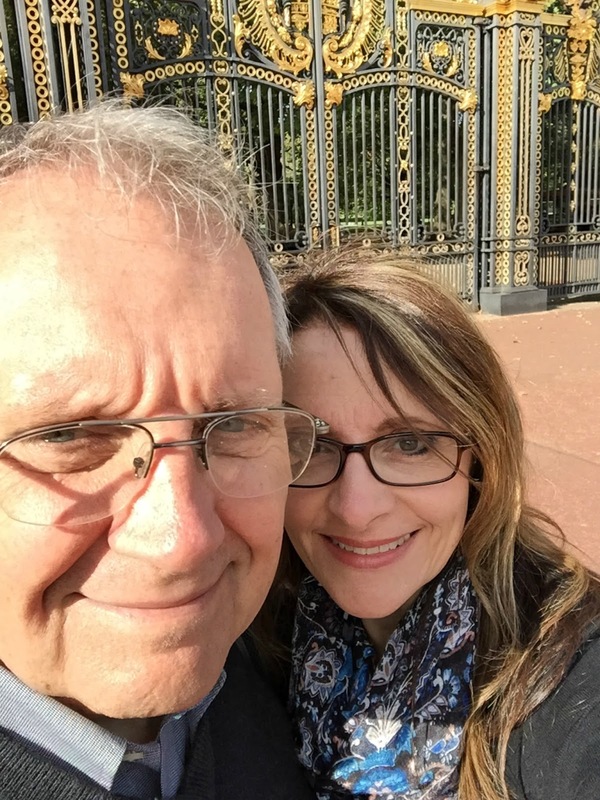 another selfie before walking from the Palace to The Royal Mews. 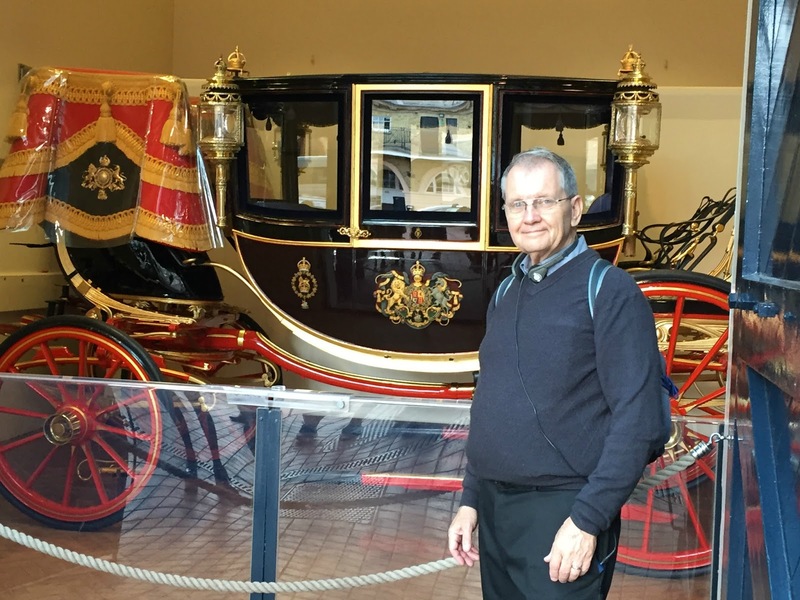 The Royal Mews provides road transport for The Queen and members of the Royal Family by both horse-drawn carriage and motor car. 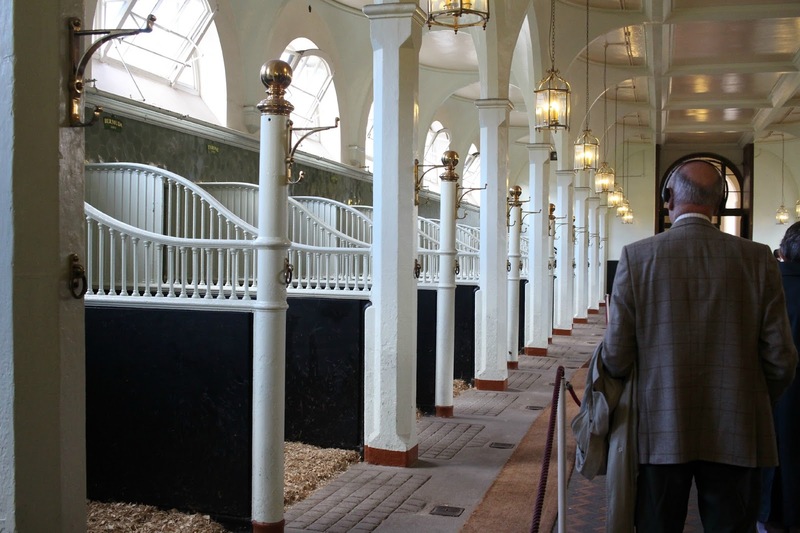 It is also one of the finest working stables still in existence, responsible for the training of the Windsor Greys and Cleveland Bays, the horses that pull the royal carriages. 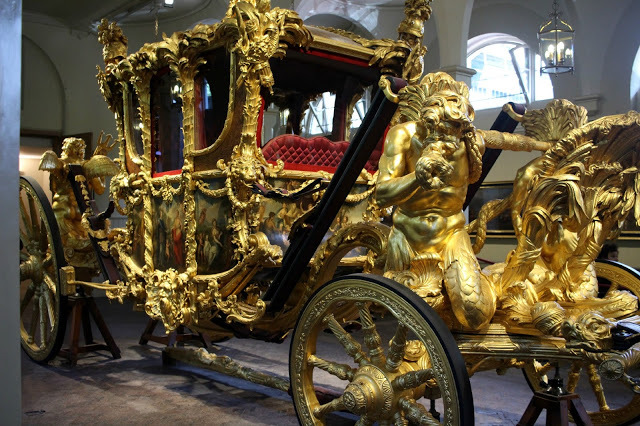 The most dazzling of all coaches housed in the Royal Mews is the Gold State Coach, which has been used at every coronation since that of George IV in 1821. The Gold State Coach is an enclosed, eight horse-drawn carriage used by the British Royal Family. It was built in the London workshops of Samuel Butler in 1762. It was commissioned for £7,562. 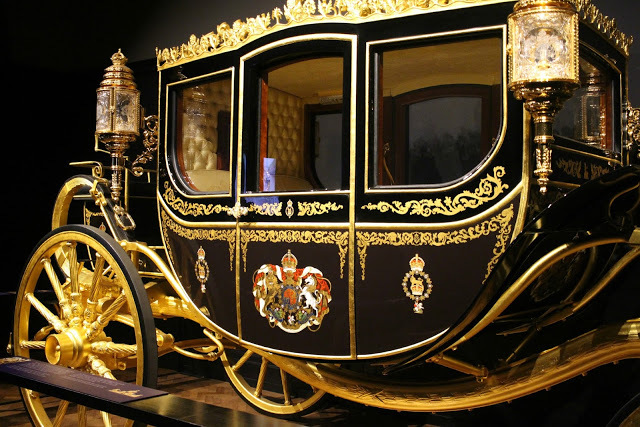 The coach’s great age, weight, and lack of manoeuvrability have limited its use to grand state occasions such as coronations, royal weddings, and the jubilees of a monarch. The coach weighs four tons and is 24 feet (7.3 m) long and 12 feet (3.7 m) high. It is gilded and features painted panels by Giovanni Cipriani and rich gilded sculpture including three cherubs on the roof (representing England, Ireland and Scotland) and four tritons, one at each corner (representing Britain’s imperial power). The body of the coach is slung by braces covered with Morocco leather and decorated with gilt buckles. The interior is lined with velvet and satin. The Gold State Coach is pulled by a team of eight horses wearing the Red Morocco harness. Originally driven by a coachman, the eight horses are now postilion-ridden in four pairs. The coach is so heavy it can only be pulled at a walk. 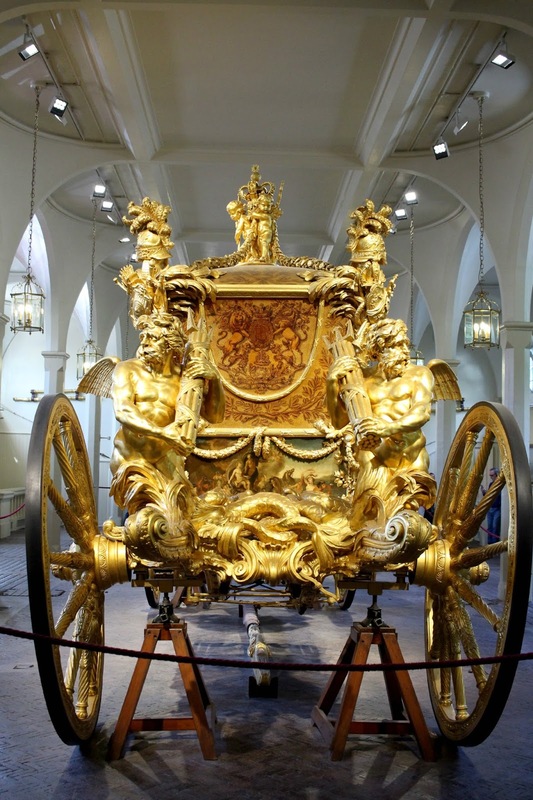 The coach has (gilded) brakes, these have to be operated by the grooms. As the coach is suspended from braces, it lacks more modern comfort. Modern coaches like the Australian State Coach and the Diamond Jubilee State Coach have electric windows, heating and hydraulic stabilisers. 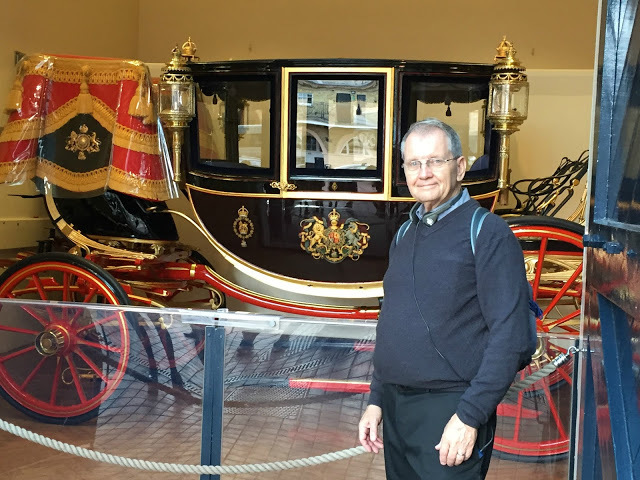 In the words of King William IV, a former naval officer, being driven in the Gold State Coach was like being on board a ship “tossing in a rough sea”. Queen Victoria complained of the “distressing oscillation” of the cabin. She would often refuse to ride in the Gold State Coach. A later monarch; King George VI said that his journey from the palace to Westminster Abbey for his coronation was “one of the most uncomfortable rides I have ever had in my life”. King George VI had the coach overhauled after the Second World War to rubberise the iron-bound wheels. This would afford at least some comfort to the passengers. The Gold State Coach has been used since the coronation of Queen Elizabeth II. She used it on the days of her Silver and Golden Jubilees. 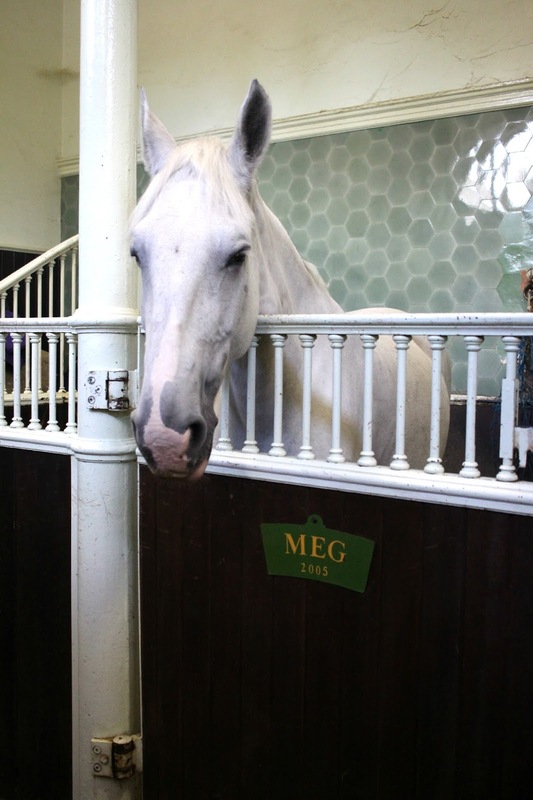 Obviously not impressed with her royal status, dear Meg could barely keep her eyes open and was the sleepiest horse I have ever seen. 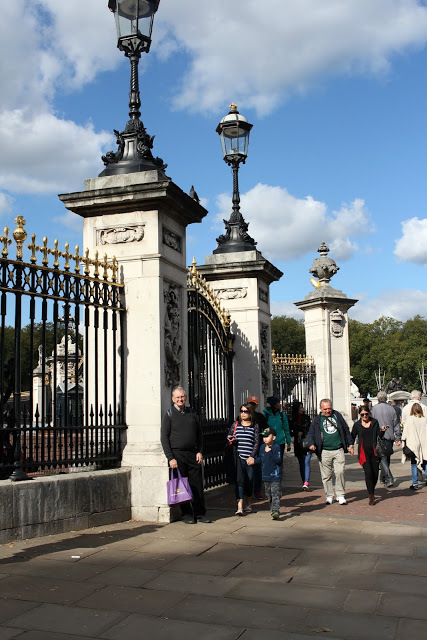 Visiting the Royal Mews, you may also see the famous Windsor Greys, so called because they were kept at Windsor during the reign of Queen Victoria and drew the private carriages of the royal family. They are at least 16.1 hands (1.65 metres) high and are chosen for their steady temperament and stamina. As expected, the stables were mostly empty but still delightful to visit. We ended this day by picking up fresh bread, cheese and chocolate from a market at Kings Cross station. 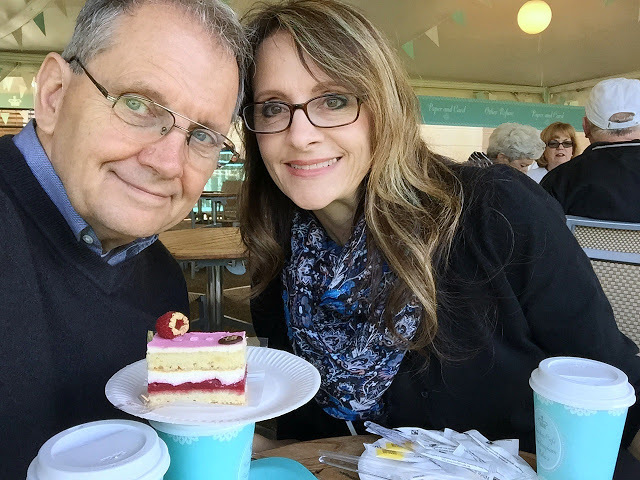 We ate in our hotel room as we sent pics home via a phone app, wrote out postcards and updated our travel journal. I enjoyed reading your post. Sounds like you are having a wonderful time! Wow…that coach is something else and the food looks amazing! So many great things to see and take in! 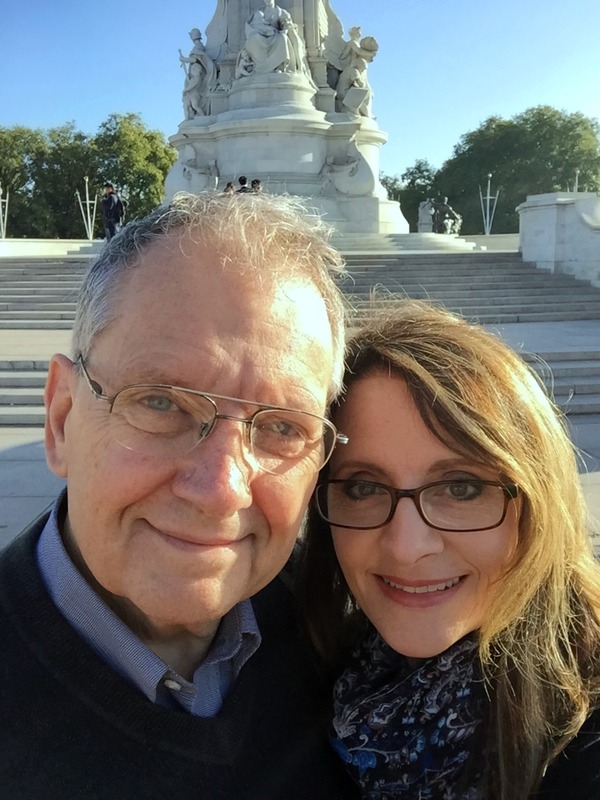 Great tour! I like your pink sponge cake! It looks like perfect weather and a good time to be there. 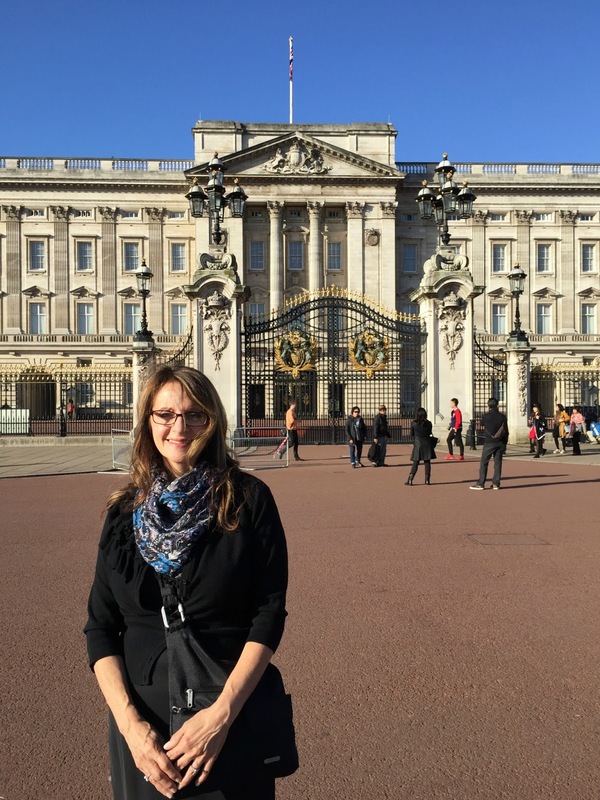 I thoroughly enjoyed this little tour of Her Majesty's residence. 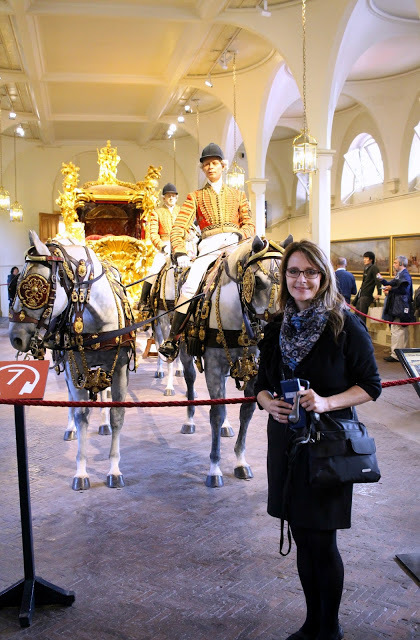 The royal mews are really something – but I'm glad I don't have to ride in an uncomfortable coach to get somewhere!